Springfield (Holy Trinity) Churchyard, Essex, contains 16 Commonwealth War Graves from both World Wars, with 8 burials from the First World War. Amongst the graves in the cemetery are those for two soldiers who served with the Yorkshire Regiment. However, they are commemorated on a special memorial, as their graves are no longer individually identifiable in the cemetery. Andy Begent of the Chelmsford War Memorial website has kindly agreed to allow his photo of this special memorial to be reused. His notes regarding the actual date of death of Corporal Edward White are included. 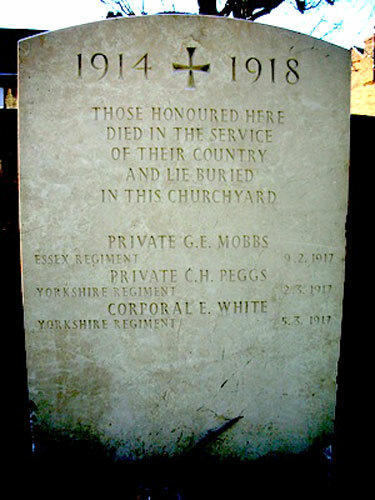 The Special Memorial in Springfield (Holy Trinity) Churchyard to Privates Mobbs & Peggs, and Corporal White. Private Charles Herbert Peggs. 43047. 17th Battalion the Yorkshire Regiment. Son of Louisa Branfield (formerly Peggs), of 22, Alfred St., Bow, London, and the late James Needham Peggs. Died at home 2 March 1917. Aged 18. Born Bow (Middx), Enlisted Poplar, Resided Bow (E). (Charles Herbert Peggs was born in Bow, London in 1899, the son of James Needham Peggs and Louisa Jane Peggs (nee Byatt). The 1901 census recorded two year-old Charles with his parents and two elder sisters at 12 Knapp Road in Bromley-by-Bow, London. His father was then a builder's labourer, but he was to die in the next few years. Charles' mother married widower William Thomas Branfield in 1909 and two years later the census found 12 year-old Charles with his mother, two sisters, step-father and three step-siblings at 86 Fairfoot Road in Bow. During the First World War Charles served as Private 43047 in the 17th Battalion of the Yorkshire Regiment. Corporal Edward White. 40543. 17th Battalion the Yorkshire Regiment, formerly 21290 Essex Regt. Died at home 5 March 1917. Aged 64. Born Edinburgh, Enlisted East Ham (Forest Gate). Edward White was born around 1853 in Edinburgh, Scotland. During the First World War he served as Private 40543 in the 17th Battalion of the Yorkshire Regiment, having enlisted at Forest Gate. He had formerly served as Private 212900 in the Essex Regiment. His home was in Springfield. He died, aged 64, according to the Commonwealth War Graves Commission on 5th March 1917, but recorded elsewhere as 22nd February 1917. 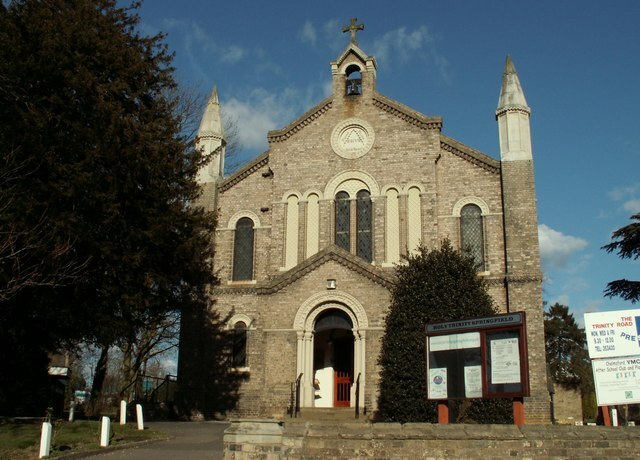 He was subsequently buried at Holy Trinity Churchyard, Springfield where he is commemorated on a special memorial. The burial register shows that his last residence was in Springfield and that he was buried on 24th February 1917, suggesting that the Commonwealth War Graves Commission's records are incorrect. Photo © Copyright Robert Edwards and licensed for reuse under this Creative Commons Licence.